The lack of satisfaction permeates nearly every facet of our lives, including: clothing, entertainment, personal goods, electronics, lifestyles, accommodations, transportation, cuisine, information, all of which just begins to touch the tip of what we have for the most part immediate access. Notice though, them are some big words – to which all of the teachers reading this are already cringing… It could have been said in this manner: we’ve gone from… Basics in clothes to brand names in everything, shoes, belts, pants, jackets, hats and so on. Entertainment used to include family games of Frisbee, badminton and horse shoes – those things that can be played OUTSIDE. Personal goods might have included more than essentials, but now it is as if you are not “in” if you don’t have a designer labelled fragrance to match every place one goes. Electronics are the rage of the age – kids now have devices that cost hundreds of dollars each and multiples of them – wired to social media as if they cannot communicate otherwise. How do we go on…. Lifestyles is a controversial topic because of the redefinition of it over time, it is difficult to tell who is coming out of closet and who is being put in the closet, and for what? If the top five (5) percent of the population on the planet live like Kings and nobility, that casts a shadow on the rest of us – especially concerning where we reside or “live”. So many in the world want to get bigger, better and more elaborate places to call home, all the while working so much they truly don’t know who is in that house at any given time. One hundred years ago, very FEW people owned a vehicle, now we have so many models and manufacturers, the sky is the limit with few ever considering if they are right sizing for their family, for themselves or in consideration of anyone else. Cuisine is just a fancy word for FOOD, but we sure do have a hankering for that too – we eat more food today than ever in history, but we also throw away more than anyone realizes. What will it take for us to be satisfied with anything? Even the information we can look through today is progressing at such a rate that few believe it can not be easily tracked any longer because of the sheer volume of it. We can flip on the news channel, to learn what is going on around the globe, where in the matter of mere seconds to minutes, tragedy can strike close to home. We’ve grown restless in leaning on the Everlasting Arms for our satisfaction. We SHOULD be satisfied! But there are others too, which is what leads me up to this point – each of us need to be Satisfied and it should surely show through our lives with Whom we are indebted by His greatest Gift, His Son. The six areas are interestingly enough from the Old Testament – God knew what He was doing – I’ve just got to follow. 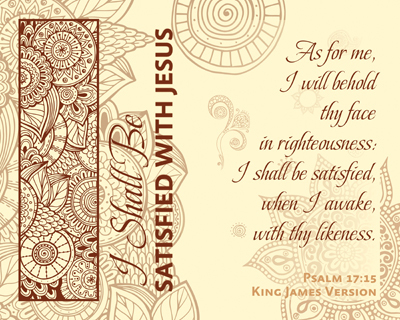 Who Shall Be Satisfied With Jesus? This Series DID NOT start out this way… It began with Him being Satisfied, but as a little deeper digging took place, it dawned upon me that if we would be Satisfied in Him, He will be Satisfied with us naturally to Him. Can we put down all those things that are SUCH a distraction to us, to get alone with Him once again? Call me old school, but I like getting out my Bible in looking up contexts of passages of Scripture, journal writing and getting off by myself to pray and meditate. As much as technology is used in my daily routine of assisting others, it reminds me that God the Creator is the High Tech One because He Built us, we don’t have to show anything off to Him. Are you Satisfied with Christ in your life? Does He satisfy your every need? Does He provide everything for us already? Will we, as His People, be Satisfied with Him once again, such that it is evident that He Reigns Supreme in our lives? As much as I want Him to be Satisfied with me, it is realized that actually is performed the other way around – I must be Satisfied with Him being my All in All and my Ever’thing! Without so much as a thought at times, a phrase is shared as a tidbit of Encouragement, or possibly added as a quip to things we say to others, in an effort to bring emphasis to something we are trying to convey or get across in a more lighthearted manner. It appears that all the “good” stuff seems to have already have been “dreamed up” or has already been said, which is then when we depend on quotes from other people, some famous and others not so famous. Amazing to note, many of them have a basis and founding in the Word of God, the Bible. How many times have we quoted someone, without fully realizing where the thought behind the quote may have actually come from? There are possibly more quotes about, concerning and throughout the Bible than we may have considered. Christians and non-Christians alike use them, in such regularity that those who even deny the Deity and Existence of Christ, use them. This Series has been driven by the impressing upon my heart, by the Holy Spirit to show each of us, how even in the lives of non-believers, they are affected by God just being God! This quote, which is used in the composition of the first print, serves several purposes. 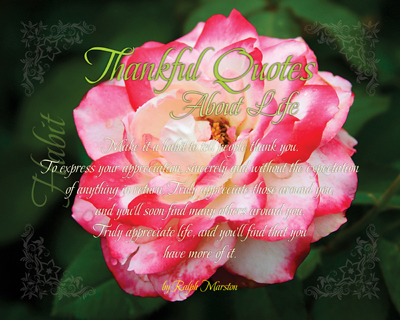 The first of which is to say “Thank You” and the following one is to do so without expecting any kind of reward for do the kind act. By doing so, as well as being genuine, others will more enjoy being around you and take pleasure in being so. Not just those that are kind to you should be the only ones you consider, Jesus said even of your enemies shall you be tempered in your response. (35) But love ye your enemies, and do good, and lend, hoping for nothing again; and your reward shall be great, and ye shall be the children of the Highest: for he is kind unto the unthankful and to the evil. (36) Be ye therefore merciful, as your Father also is merciful. Tall orders, but ones that we can and should put forth as Christians – all through the sharing of a quote… Indeed if we will walk with Him daily, the Habit will become a natural part of how we Worship our Lord and Saviour. There are thirteen (13) Quotes that are utilized in this Series which each have a founding in the Bible to remind us that what we use in everyday conversation has rooting in the Word of God. So much of our culture and structure of living is more influenced by biblical definition that many realize. Are there things that you say that would remind others of things that can be found or related to in the Word of God? It may surprise you that many of the common sense things we hear today have a strong hold, reach and rooting in the Bible. Knowing this is the case can provide us an opportunity to share the Gospel with others as they may express an interest in where that “quote” may have originated. Maybe even a conversation starter could be made of that something familiar a person can relate to, which could well be the Holy Spirit working in the heart of an individual to draw them to Himself. We cannot dismiss the opportunity to share with those that develop that interest in how we know or knew how find the basis in which a quote is built upon. There are thirteen (13) of them to begin with – pure amazing that conversation starters can be found which have basis in where we would like to take those we are witnessing to, hoping that starting will become a life changing event for them when they Hear from the One and True God, as they consider His Word for the only basis of and for their Salvation. It is when we consider death, that life become so much more IMPORTANT and others are more open to hear what God and His Son have done for each of us who makes a choice to Believe. (6) Humble yourselves therefore under the mighty hand of God, that he may exalt you in due time: (7) Casting all your care upon him; for he careth for you. Too many times, that is when we recognize that there is a problem – when we get to the end of our proverbial rope – He’s been there the ENTIRE time, not just when we have gotten ourselves into the current mess we find staring us in the face. Sometimes we get weary in the waiting because we think that the problem, situation or challenge should be answered, solved or taken care of IMMEDIATELY… That is NOT what our Creator God of Everything says… It is another one of those misses that we can experience due to our instant expectation, gratification and satisfaction response requirement we place upon our view of Him, which is contrary to any biblical Promise. 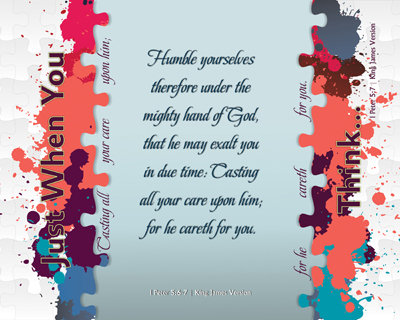 His order is humble therefore, that He “may” Exalt in due time – we must cast our care “upon Him”, for He “careth” for you. Each of the challenges and expectations stated in this Series with a direct answer from God’s Holy Word has a noted timeline, from the past, to the current, through the future – none of which is “RIGHT NOW” or is influenced by our making demands upon our Sovereign Creator. His Timetable is not like ours, neither is His View of time. One of the things we as Christians should note in looking at each reference given from Scripture is that they are all Promises and Answers that every Christian now has access to having for themselves. It is as though we are given a waiting period, sort of like a cooling down period of time, then when the dust settles so to speak, the answer becomes clear and focused, uninfluenced by what we think we can do or are capable of doing. There are fourteen (14) total passages of Scripture, with thirteen (13) challenges with direct answers from God’s Word to those challenges. These challanges, which are contrary to what people may call excuses, because at the time to the person who says them, they are REAL and are INHIBITING them from experiencing all that our Creator God and Lord Jesus Christ would have for us. Do You Think No One Cares? As this Series came together, with a few rabbit trail runs, it became VERY real to me that this is a list in which we each as Christians can get caught up, anytime we lose focus and dependence on Him Alone. They ALSO are VERY clearly that challenge of the worldly person who knows NOT the Love of Christ and the indwelling of the Holy Spirit. These are dual purpose because they provide answers to challenges all mankind experiences in life, for they are Promises that God makes to us in His Word. Which of these apply to me and you right now? Do you know of a Christian who is struggling with one of these areas? How about those that you spend time with, do they see the answer side of these challenges in your life? People, Christian and non-Christian alike, will be able to tell which side of the source you are located – the “challenge side” or living the Victory He Gives in His Word, “His Promises” to us. Join me in living the Victory on His Promises, first by Humbling ourselves, then Standing on His Promises! With this Series, developed from a combination of studies, it is amazing to see how the Lord put these together in a package that would cover so much. As is often said of me, it is NOT my words that one needs to hear, but rather the One’s Word that should be shared such that the heart will listen. There is NO better way or manner which a simple man can present a Spiritual answer than to hear from the Holy Spirit inside as responding to hearing, seeing or reading God’s Word. 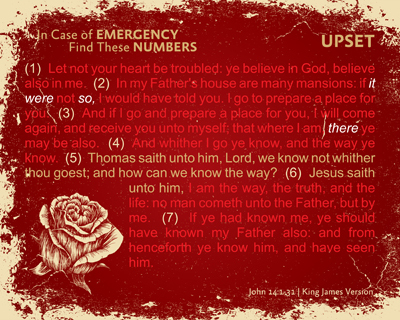 There are seventeen (17) individual Emergency cases presented in this Series, from being Upset, being Lonely, having a Lack of Faith, to Struggling With Loss – all of which have an EMERGENCY number associated with them as if they were contained in a Bible “Yellow Pages” type of directory. Notice that the prints are created in Red, Gold and White – with Red being the dominate color. Why? Simple, because all of the answers, examples and helps are all made possible to us today because of the shed Blood of the Risen Saviour, Jesus Christ. Many people will not guess my favorite flower correctly. There are several reasons for that – for the Series developed has a well balanced presentation of color, type and location. The rose pictured is actually what most would call a “regular” rose, verses a “knock out” rose (or tea rose), not the flower name the Lord Jesus Christ was compared. There is some debate as to whether the name referred to a Crocus or Hibiscus Tree, but the name is “Rose of Sharon” – which is NOT red, neither is it a “rose” in the basic sense. Does that remind us of how different Christ is amongst all the claiming and proclaiming crowd of today? The main base color for this Series is deep red. Not only is He the One that stands above them all, it is because of His Shed Blood we have the opportunity to “read His Word“, “have a Relationship with Him” and have open access to the Throne of Grace. Keep in mind there are two “list Scriptures” to review – seventeen (17) short versions and seventeen (17) fully fleshed out portions of Scripture. This Series has been a focal point of mine for nearly two weeks through vacation and a trip to the West Coast – enough time to make me wonder if it would get completed in ANY assemblage of normal time! The individual pieces of it were not at all difficult, but once the full picture was built, it no longer confused me as to why it was taking me so long… Sometimes, the simple is made profound to or for us the most. As Christians, it may have come to us the easiest in hearing about Faith and Works, which is a common theme to be discussed with an Individuals dedication and devotion to Christianity. Oftentimes the defense of one (Faith) is pitted or leaned upon the other (Works) in order to explain our Salvation. There are several passages of Scripture that can be used to support each part of the argument being made. Even so faith, if it hath not works, is dead, being alone. 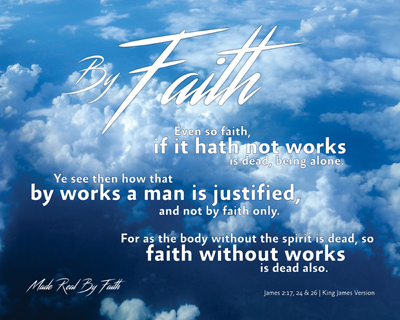 Yea, a man may say, Thou hast faith, and I have works: shew me thy faith without thy works, and I will shew thee my faith by my works. Both of these passages (in part or in whole) are used in this Series to present the case for knowing By Faith what we have and is committed to doing, but an additional side is given, the Evidences from throughout the Bible of lives having been lived By Faith. In the Book of Hebrews we are given a historical account of some of the most incredible Evidences of Faith the world has ever known, both small and large. There will be some that say that our Faith is unfounded, where others will agree that it is undeniable, but we MUST realize it is us that hold the key to others seeing what our God, Creator and Saviour has done in, thru and for us. We stand in GREAT need of His Help, Guidance and Will – such that our lives will be all that He wants it to be and that we can be for Him. There are twenty-eight (28) passages of Scripture utilized in this Series to create a magnificent display of God’s Hand in the lives of those He has shared with us through His Word, which He reminds us by giving Evidences that we each can understand, comprehend and realize. When we read the Word of God, what is it that we are hoping to discover, find or uncover? Is there a situation where an answer is being sought as to how something was done or handled at a specific time? Have we ever found ourselves “looking” for answers within the covers of the Holy Word? I’m convinced we should be! There is a “secret”, well, a couple of them… In order to understand the Book, you must get to know the Author and must have the Key in which to unlock the meanings of the Word contained within – the Holy Spirit. My starting for this Series was based on how to show others had Faith and how it was made Evident in their lives – and it was FOUND for sure. I’ve been blessed to have created ten (10) other Series on Faith, but this one is TOTALLY different, which is what the Lord wanted it to be, because He was answering a question of mine – with thirty-six passages, plus quite a bit more in research to find the contexts for them. Simply wanted to have proof of what was “being presented” which just literally fell right out before my eyes – what a JOY it is to search God’s Word KNOWING that He Knows just what I need. When is the last time this has happened to you? How long did it keep your attention captive? Does the hook get set like it used to some time back? It sure does for me and it is something I’d like to convince every person who reads this Series of – God’s Word is AMAZING and FULL of Promises He has already kept and many more that He intends and is FULLY capable of Keeping!